Actually, this is really important. No, it's not some daring act for cool, beautiful actors to appear in their 70s grunge and ugly fashion; it's a direct and combative political statement. Anti-capitalists have been fond of citing events of the 1970s as being the cause of "degenerative capitalism" in America and the reason why we are such thoroughly terrible people today (consider, for example, Dark Shadows, Argo, parts of Cloud Atlas, the upcoming film Rush with Chris Hemsworth, The Conjuring and probably parts of Lee Daniels' The Butler). 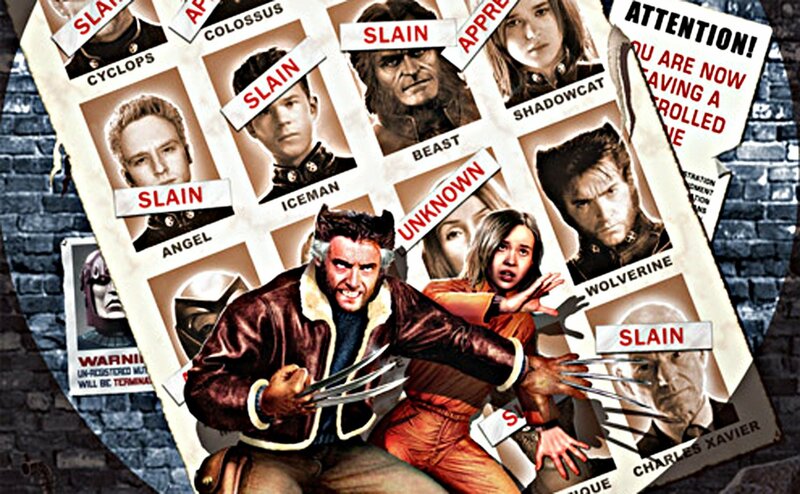 I can't be definite that X-Men: Days of Future Past will be pro-capitalist, however, given the exceedingly strong pro-capitalist message of The Wolverine, I can't imagine film makers will divert from that path for this film, leading us to an important question: why would the first official image released of the film (some minor, teasing posters have been released, however, this is the first official image of the film released) invoke the 1970s? First, we see three men united, they stand together; secondly, this is--from their awful clothes--obviously some time in the 1970s, and from the title, we know the days of the future are intimately tied to the days of the past, that who we were in the 1970s pre-figured who we are today. Given the outrageous anti-capitalist overtones of American Hustle, we can assume this image was chosen as a direct response against the images in the trailer for American Hustle (trailer below). (It's also highly possible that The Avengers 2: The Age of Ultron will throw us back to the 1970s because Ultron was conceived/born in the late 1960s). Last, but not least, we know the stories Days Of Future Past is based upon come from the magic year: 1981 (Evil Dead, Red Dawn, references by The Amazing Burt Wonderstone, Wreck-It Ralph, The Internship [referencing Flash Dance continually!] and Clark Kent coming to earth in 1981 in Man Of Steel) all remind us of the first year of the Ronald Regan presidency when American capitalism took full force over the economy and rekindled American confidence to really be a super-power. Again, I want to emphasize, I could very well be wrong: films on opposite sides of the debate have employed the same images and language to use against the other side and confuse audiences about who is who. 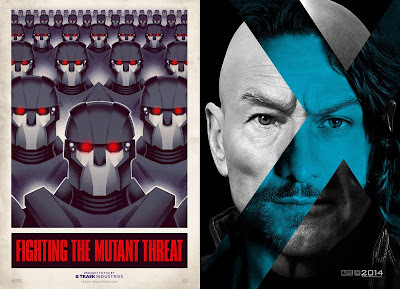 If we look at the poster on the left (and you may click on the image to expand it in another window), the rows and rows and rows and rows of the sentinels (robotic guards) clash with this rather intimate portrait of Charles Xavier (Patrick Stewart, James McAvoy). How? The "portrait poster" reveals how everything that has happened to us becomes a part of us, it changes who we are, either through helping us abandon the bad or cling even tighter to the good, but history has shaped us. The sentinels, on the other hand, are not going to be influenced by what happens to them, except as hardware upgrades: robots are robots. We have seen characters like the robots in two other places: Seneg, the androgynous female Israeli soldier in World War Z, and the "peace keeper" guards in The Hunger Games Catching Fire. THGCF wants us to see the peacekeepers as mindless capitalists who protect the upper-class and their wealth while repressing everyone else (like the robot guards in Elysium). In World War Z, Seneg who doesn't even look female most of the time, has no personal identity and no history, the ideal of a good socialist who is a soldier for the state and has completely abandoned their individuality, and that's how I see the robots in the poster on the left. Whereas mutants are intensely individual, no one else has ever been or will be like them (emphasizing our own individuality), and our free will, our free choice to embrace our individuality or abandon it, and the choices we make all throughout our lives will ultimately determine which we decide to choose, but we cannot escape ourselves, and for Christians, this is a blessing, because it helps us draw nearer to Our Father and our destiny created just for us; for those who despise God or don't care, their very individuality becomes a curse, a burden, and they start hating themselves because they reject God living in them and turn away from God even more. This is the reason why socialists embrace the philosophy they embrace, and capitalists tend to embrace the philosophy they embrace. ﻿﻿﻿﻿Here is the second trailer (containing more details about the narrative of Bruce Lee's martial arts master, Ip Man); the tagline for this is, "In martial arts, there is no right or wrong, only the last man standing." It's important that this Chinese film takes place between China and Hong Kong because of their different histories (Hong Kong was under British rule for nearly an eternity, and is now considered one of the "most free" markets in the world (free from government regulation, contra China's communist government and centrally dictated market). "They see your every move," is this supposed to remind us of the NSA scandal of the Obama Administration? Well, as we surmised with the immense popularity of Taken 2 (which opened the weekend of the Benghazi attacks and international riots by Muslims against the US) the best art is prophetic, that is, it knows the likely direction events are apt to lead us and gets there before we do so it can immediately offer its wisdom of why and how we got there and what we are supposed to do about it. With Closed Circuit (from the producers of Tinker, Tailor, Soldier, Spy) the incredible amount of spying being done on citizens (in this case, Britain) still can't stop the terrorists from bombing and killing people (we also get an idea of how "controlled" English society is in Fast and Furious 6 with all the cameras everywhere and no one being able to own a gun except the criminals; yea, the police didn't even have guns). 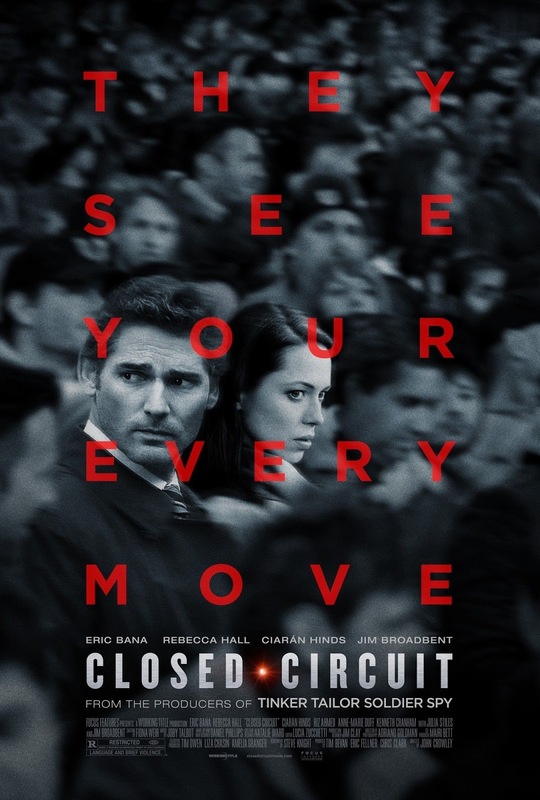 ﻿﻿Martin (Eric Bana) and Claudia (Rebecca Hall) are ex-lovers who team together on a defense team to protect a terrorist; also starring Jim Broadbent (Dennis in The Iron Lady), Ciaran Hinds (The Debt, Tinker, Tailor, Soldier, Spy) and Julia Stiles, the film will probably be a fantastic drama opening next weekend with Ethan Hawke's and Selena Gomez's Getaway. A government working with terrorists, as we saw in Zero Dark Thirty, isn't anything new; however, in the atmosphere of Obama's Fast and Furious guns scandal and evidence of 20,000 US missiles being stolen last year, and Ambassador Chris Stevens being sent to Benghazi as part of an agreement to arm Syrian rebels (the Muslim Brotherhood), a film such as Closed Circuit could do the same as pro-socialist/anti-capitalist films we have been seeing: plant an idea in the mind of the audience that something is plausible so, when it happens (a government attacking its own people) we aren't incredulous to it, but can see a "pattern" of behavior and cover-ups. Clary (Lily Collins) holds back an army of darkness and death, the ultimate shadows. The "spotlight" feature (the light on Wolverine and Shadowcat, and the darkened out edges of the poster to make a spotlight) and stylization reminds me of some of the classic film posters for the science fiction films of the 1950s. Why? Well, the films of the 1950s were largely a self-examination of who we are so we would know who the Soviets and Chinese communists were NOT. 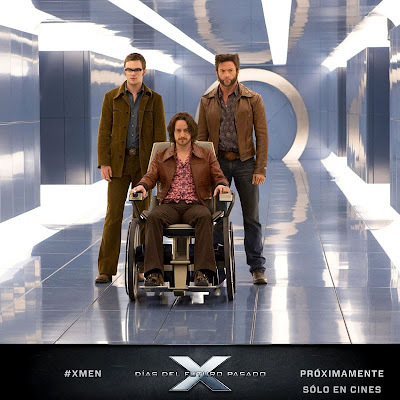 Again, this is speculation about the newest X-Men film. What is apparent, however, is that all the mutants are going to be teaming up together to fight this newest threat from Trask Industries. Why? There are times when even enemies must join together to fight an even greater evil, and from the post-credits scene of The Wolverine, that appears to be the case. We can say definitely that the X-men who defended people and fought for good, are now being the enemies and portrayed as bad; where is this happening with society? People like those in the Tea Party being called terrorists by the media and liberal politicians (and we see this exact same thing happen in Red 2 when Bruce Willis' and John Malkovich's characters are trying to save the world but corrupt government officials are trying to save themselves and label the good guys as "homeland terrorists"). Again, I could be wrong, not much information has come out about the film, but please consider this: The Internship (Vince Vaughn, Owen Wilson) is almost as pro-capitalist as you can get, and several times in the film (in addition to Flashdance being invoked) the X-Men is watched by the group of interns to inspire them to work together, so I'm not the only one seeing the history/tradition of the film in this light. On another but important note, we have seen the rise of "team films" lately: The Internship (the individuals have to work together as a team), The Avengers (Tony Stark has to learn to play with others), Fast and Furious 6 (Dom's team and Hobbs needing that team), Mike and Sully teaming up with the fraternity in Monsters University, Gru joining the Anti-Villain League in Despicable Me 2, all the Joes working together (with Storm Shadow and Joe) in GI Joe Retaliation, the upcoming Batman and Superman film and, of course, X-Men. We see strong individuals, like Captain America and Wolverine, but they are able to sublimate their egos to join a team; why is this important? Because that's what is called for at this time in history. America has been somewhat of a "lone player" on the international scene for awhile, but it can't be like that anymore: we have to team up, Americans with Americans and on the larger, world stage.